The Anglo-Saxon period in Britain spans approximately the six centuries from 410-1066AD. The period used to be known as the Dark Ages, mainly because written sources for the early years of Saxon invasion are scarce. However, most historians now prefer the terms early middle ages or early medieval period. It was a time of war, of the breaking up of Roman Britannia into several separate kingdoms, of religious conversion and, after the 790s, of continual battles against a new set of invaders: the Vikings. Climate change had an influence on the movement of the Anglo-Saxon invaders to Britain: in the centuries after 400 AD Europe's average temperature was 1°C warmer than we have today, and in Britain grapes could be grown as far north as Tyneside. Warmer summers meant better crops and a rise in population in the countries of northern Europe. At the same time melting polar ice caused more flooding in low areas, particularly in what is now Denmark, Holland and Belgium. These people eventually began looking for lands to settle in that were not so likely to flood. After the departure of the Roman legions, Britain was a defenceless and inviting prospect. Anglo-Saxon mercenaries had for many years fought in the Roman army in Britain, so they were not total strangers to the island. Their invasions were slow and piecemeal, and began even before the Roman legions departed. There is even some evidence to suggest that, initially, some Saxons were invited to help protect the country from invasion. When the Roman legions left Britain, the Germanic-speaking Angles, Saxons, Jutes and Frisians began to arrive – at first in small invading parties, but soon in increasing numbers. Initially they met little firm resistance from the relatively defenceless inhabitants of Britannia. Around 500 AD, however, the invaders were resisted fiercely by the Romano-British, who might have been led by King Arthur, if he existed – and there is no hard evidence that he did. However, the Saxon monk Gildas, writing in the mid-6th century, talks about a British Christian leader called Ambrosius who rallied the Romano-British against the invaders and won twelve battles. Later accounts call this leader Arthur. See 'Saxon Settler' lesson plan. The Celtic areas of Britain regarded the Saxons as enemies and foreigners on their borders: their name became Sassenachs to the Scottish and Saesneg to the Welsh. 1. Kent, settled by the Jutes. Ethelbert of Kent was the first Anglo-Saxon king to be converted to Christianity, by St Augustine around 595 AD. 2. Mercia, whose best-known ruler, Offa, built Offa's Dyke along the border between Wales and England. This large kingdom stretched over the Midlands. 3. Northumbria, where the monk Bede (c. 670-735) lived and wrote his Ecclesiastical History of Britain. 4. East Anglia, made up of Angles: the North Folk (living in modern Norfolk) and the South Folk (living in Suffolk). The Sutton Hoo ship burial was found in East Anglia (see below). 5. Essex (East Saxons). Here the famous Battle of Maldon was fought against the Vikings in 991. 6. Sussex: the South Saxons settled here. 7. Wessex (West Saxons), later the kingdom of King Alfred, the only English king ever to have been called ‘the Great', and his equally impressive grandson, Athelstan, the first who could truly call himself ‘King of the English'. By 850 AD the seven kingdoms had been consolidated into three large Anglo-Saxon kingdoms: Northumbria, Mercia, and Wessex. 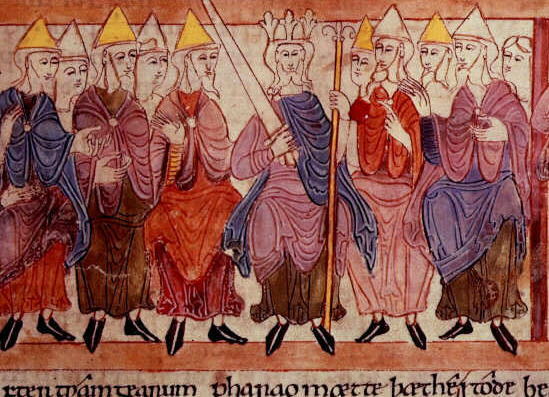 The Anglo-Saxons had become a Christian people. Beowulf, about the great hero who fought and killed the monster Grendel and his mother, became a great king and met his death fighting an enraged dragon. There are several versions of the poem for children, as well as a cartoon film. Rosemary Sutcliff's version is excellent. The Battle of Maldon, about the Saxons' heroic defence against a force of raiding Vikings in Essex. This burial of an East Anglian king provides a rich case study from which we can draw inferences about kingship, religion, warfare, trade, craftsmanship. See the Saxon Ship Burial and Sutton Hoo lessons, and the Sutton Hoo objects exemplar. commissioned the writing of the Anglo-Saxon Chronicle, a historical record of the Anglo-Saxons in Britain. After 793, when the Vikings raided Lindisfarne Monastery, the history of the Anglo-Saxons becomes entangled with that of the Vikings. In many ways they were similar: in language, religion and Northern European origins, yet they are not the same. The very fact that they invaded Britain at different times makes them two very distinct peoples in our history.